As purveyors and stewards of information, library scientists and archivists have important and growing responsibilities to actively and meaningfully participate in our data-driven world, and apply data science techniques to improve library services and operations. We are addressing this need through the LIS Education and Data Science for the National Digital Platform (LEADS-4-NDP) program, as part of the Institute of Library and Museum Services (IMLS) Laura Bush 21st Century Librarian Program. 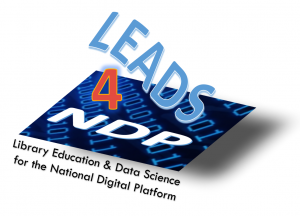 LEADS-4-NDP is preparing next generation LIS faculty so they may meaningfully integrate data science and LIS education. In 2018, LEADS-4-NDP supported 10 LEADS Fellows from ALA accredited programs across the country. 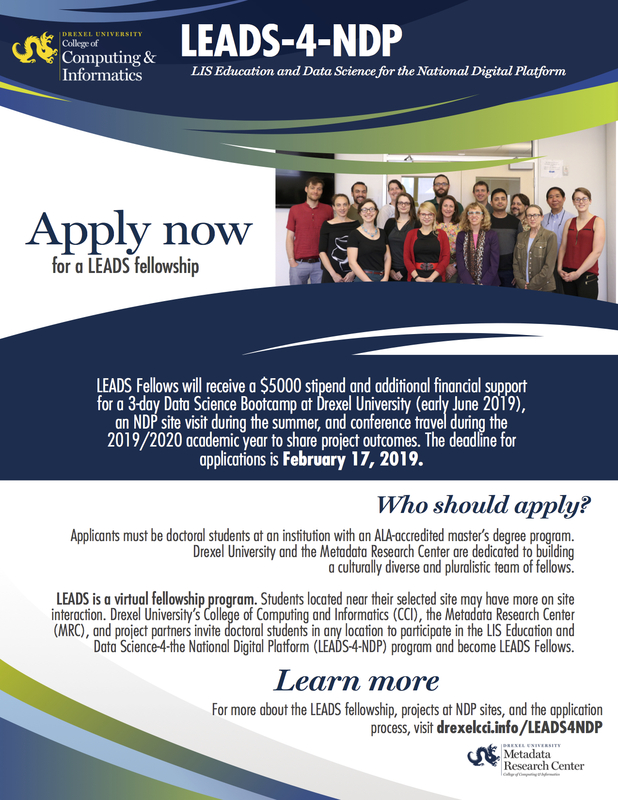 LEADS program continues, with a call for 2019 LEADS Fellows: applying to LEADS, The 2019 LEADS Fellows will receive a summer stipend and complete the following: 1) an online preparatory curriculum, 2) an intensive 3-day data science bootcamp at Drexel University (June 6-8), and 3) a ten-week data science internship over the summer, with a LEADS-4-NDP project partner. Internships will be virtual, although some LEADS Fellows will be in the vicinity of their assigned NDP site. To learn more, read below. For inquiries about this unique educative program, please contact the Metadata Research Center (mrc.metadata@drexel.edu), or Jane Greenberg directly. To learn more about the LEADS-4-NDP at its IMLS homepage, click here.